A few years ago, my Mom gave me a pair of jeans that didn’t fit her anymore. She’s a few inches taller than me so they were a little long but fit well otherwise. I asked her to cut them off into capris, which she did and I wore them for several years. I noticed at the beginning of the year that they were getting pretty threadbare. I bought a denim patch to try and salvage them but eventually had to accept the inevitable truth that the jeans had had their day in the sun and were ready to go to the big consignment shop in the sky. There were certain patches of denim that were still good though, so I cut out those bits of fabric thinking I might use them in a future project. It’s a little smaller than I would’ve liked, but that’s only because I’d never done any patchwork before and I made my seams too big. Still, I like the way it turned out and I love that the jeans will live on, having borne the booties of two Floofenheimers. Seculo seculorum! This entry was posted on May 11, 2008 at 5:11 am and is filed under Sew-licious, Tunage. You can follow any responses to this entry through the RSS 2.0 feed. You can leave a response, or trackback from your own site. Lucky mum – that looks great. Thanks so much for stopping by the blog. Take care. It’s gorgeous! 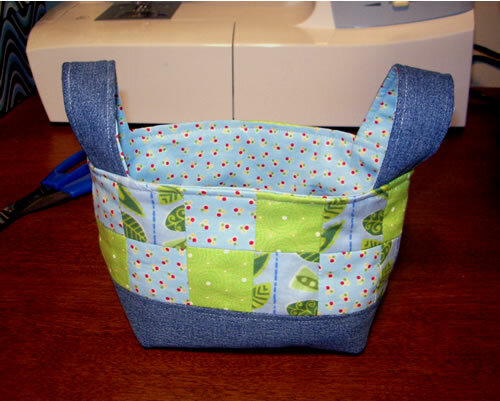 I have a ton of denim from old jeans to use up and I think this is a perfect way to do it! Also, I love The Shins! I love patchwork, but the recommended seam allowances are usually too tight for me, too. I just cut the squares a little bigger, & it turns out okay. Very pretty! Did your mom love it?